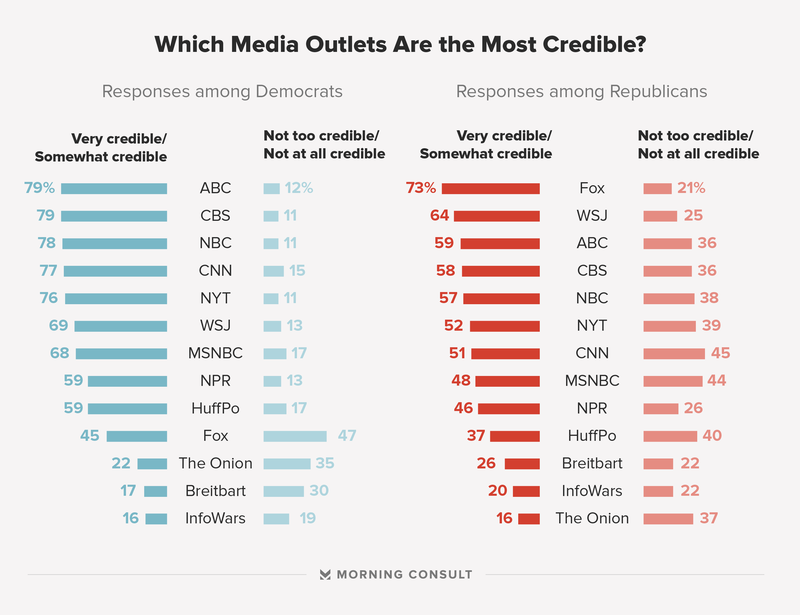 Despite the proliferation of coverage of fake news and historically low opinion of the media, a majority of adults think most cable news networks and major newspapers are credible, according to a Morning Consult poll. RELATED: Who Should Be Responsible for Policing Fake News? 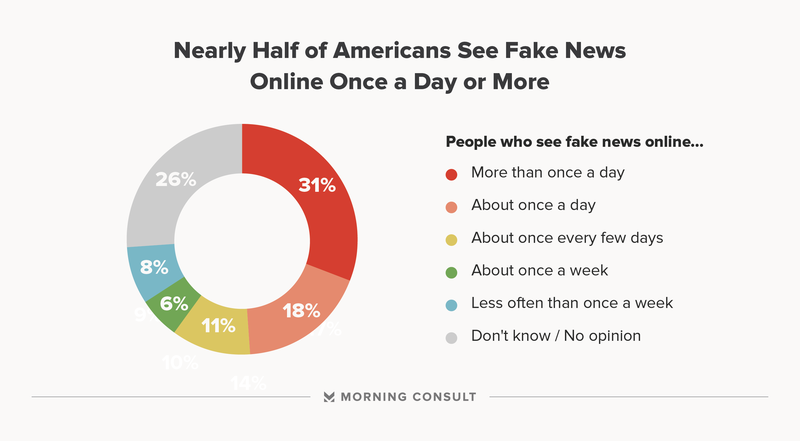 And while it’s unclear how people’s views on the media predict their ability to detect fake news from reporting, the adults polled said they see it in their social media feeds frequently. Thirty-one percent said it happens more than once a day, and 55 percent said they have started reading a story only to realize it was fake. 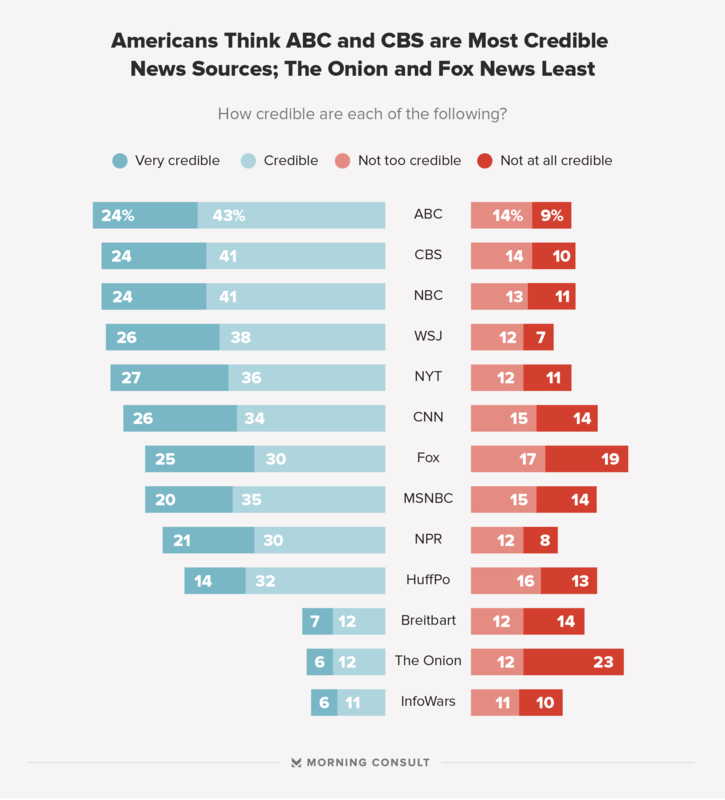 Television news gets the highest number of people saying they are credible, with major newspapers such as The New York Times not trailing far behind. ABC led all outlets with 67 percent of people saying it is credible, and CNN was top among cable news networks with 60 percent. Sixty-five percent said both CBS and NBC are credible and 55 percent said the same about the more partisan MSNBC and Fox News channels. Fifty-one percent of people said they consider National Public Radio to be credible, but the outlet might be affected by a lack of awareness. Seventeen percent of people said they had never heard of NPR, compared to two and four percent of people who could say the same about The Wall Street Journal and The New York Times, respectively. The Huffington Post had similar numbers, with 10 percent of people saying they never heard of the site and 46 percent of people saying they consider it credible. Sixty-four percent said The Wall Street Journal is credible, giving it just a 1 percentage point edge over The New York Times. Credibility was significantly lower for far-right sites such as Breitbart and InfoWars, but both were also hampered by being largely unknown. Forty-two percent of people said they “never heard of” Breitbart, and 49 percent said the same about InfoWars. Twenty-six percent said Breitbart was not credible, while 21 percent said the same of InfoWars. Breitbart and InfoWars did better with Republican men, with 32 percent and 27 percent respectively saying the sites were credible. This poll was conducted among 1,605 adults from December 1-2. It has a margin of error of 2 percentage points. Toplines are available here and crosstabs are available here. Correction: The third chart in a previous version of this story misstated CNN’s credibility numbers among Republican voters.